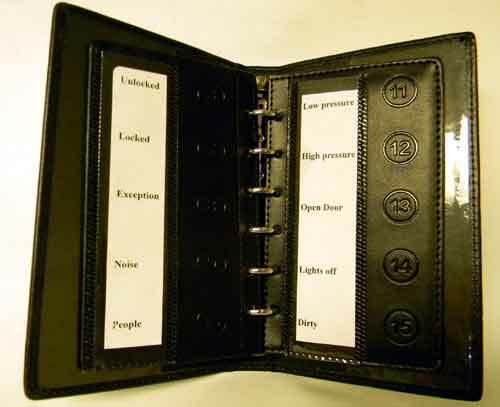 Detex ProxiPen Incident Book. List incidents with the checkpoint reports. Each tag is then given an actual incident name for your reports. Tag 7 = Vandalism and so-on..
Each is embedded in a leather “page” which is easily removed from the leather bound carrying case (two pages of 10 incident codes, each). 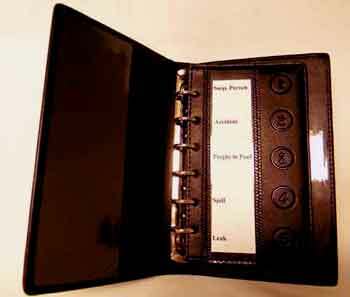 - easily fits in a shirt pocket, with room to spare. 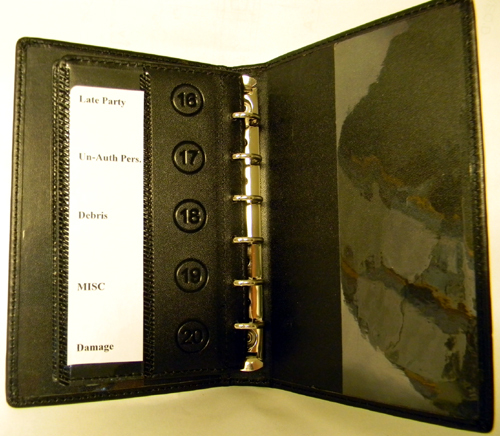 This Texas Cowhide booklet has 20 embedded incident tags on removable leather pages, 10 incident tags to a page - on each side. Remove the incident pages from the booklet and carry them in a pocket. Change them to whatever you need them to say. When the guard finds something amiss at the checkpoint, he records this incident. This incident shows up in the reports, associated with that time, guard, and checkpoint.